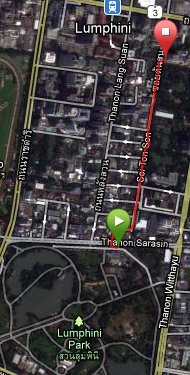 I knew that our hotel was "close" to a park that was known for running and exercising, Lumphini Park. It has a 1.6 mile outer loop for running or biking plus a couple ponds with paddle boats. They do have a lap pool at the park but membership requires a doctors note to ensure you don't have any contagious disease. Maybe they haven't discovered chlorine? 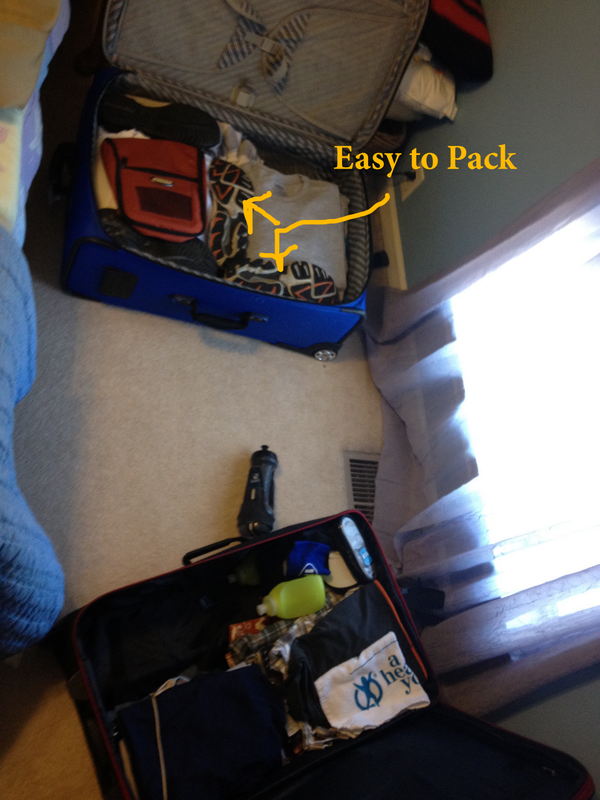 I already discussed my route to get to the park, but it is actually different than what I originally plotted out. It may be tiny but there are a couple vendors down that section, so if you need a dinner after a hard workout you can grab something on the go! This little trek is about a kilometer (.62 miles) and takes about 12 minutes to walk. I have thought about running down the long stretch but there are random speed bumps and, of course, pot holes. I don't really want to trip on something when it's dark. It took about 10 - 15 minutes to acquire satellites. My first run was the first Sunday after I arrived. I was immediately introduced to the heat and humidity of Bangkok. I was drenched in sweat before I even got to the park! I brought my water bottle from the North Face marathon relay but it didn't last long. It was a 4.5 mile run at a blistering 9:18 pace. I definitely walked some of the last lap. It was about 8:30 in the morning, but I couldn't escape the heat. I'm going to have to get used to the heat and quickly. Someone get that fool a towel... and some Rogaine, oye! Click here to see my Garmin GPS data. Distance of 6.22 in 30 minutes! I should be able to qualify for Boston with that pace easily! No no... that's kilometers! I'm not sure why that shocked when I set the speed for the first step on the conveyor belt. It dumbfounded me to have to convert miles to kilometer but luckily I have a footpod for my shoe so I can monitor my speed in pacing that I'm used to. The next day I stuck to strength/core exercises and then I did 30 minutes on the stationary bike. Thursday I hopped back on the treadmill and did intervals. This time I did my research and pre-planned the KPH so I hit my normal pace for the interval and rest period. After my first week I managed a respectable 13.1 miles. 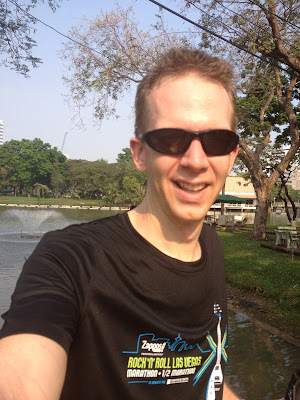 My second Saturday was pretty wide opened so I set out to Lumphini Park at 7:30am and started my run around 7:50am. After 10 minutes I started to hear music being played over the Public Address speakers in the park and then noticed everyone had stopped. The entire park was standing still. So I stopped. It seemed like most people were standing in a particular direction. So I turned. After a minute the music stopped and everyone went about their business. It was so weird. I just assumed (and later confirmed with a Thai associate) that it was the national anthem. They do this at 8am and 6pm every day. I do recall leaving the BTS/SkyTrain just before 8am and hearing music being played and no footsteps. This happens at many of the public facilities. I have yet to experience the evening National Anthem but that's because they don't play it in bars during happy hour. So the respectful thing to do is stand and listen. Don't go about your business. Don't take this as an opportunity to hurry past the hustle and bustle that is Thailand because at 8am and 6pm there is no hustle and bustle for about 50 seconds. It was a nice breather during the start of my run. I managed 6 miles that morning as the heat and humidity wasn't as bad. I actually did another mile because I decided I should properly configure my footpod. This requires running while it uses the GPS system to determine how many steps you take over that distance. That way when I use the treadmill or run in a cave it will correctly calculate my speed. Something I also noticed during this was that there was a race earlier that morning! They were taking down banners for the "Iron Man Mini-Marathon". Can you guess what it was from that description? Just a 5k / 10k race. I saw people walking around with race shirts on and a few with medals. I was totally jealous and mad at myself for not looking into it. My second week turned into a bit of a lost week training-wise. I worked late pretty much every night due to conference calls and other after work events (happy hour... maybe). I actually didn't get the running shoes laced up until 8 days later on a Monday night but the biggest issue was I wasn't sleeping very well. My attempt to fix this actually caused me to miss more runs. I'll explain below. 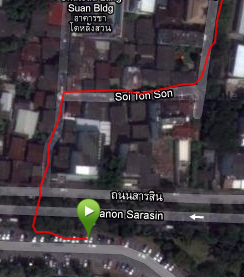 So on Monday I made it a priority to get back to the hotel so I could trot down to Lumphini for another run. The weather was much cooler and I picked up the pace too. I did 5 miles at an 8:30 pace. I stopped early because my knee was bugging me again. Since arriving and getting passed jet lag, I usually seem to fall asleep ok but I wake up around 1am then every hour after that. I realized the temperature in my room has been inconsistent so I started closing the door to my bedroom and turning the AC down (colder). It seemed to help me sleep better. After a few days I started getting a sore throat and then sneezing. My best guess was the AC was blowing air over me in my sleep and making me sick. So with the cold I didn't spend much time in the gym, plus the weather was getting warm again to go outside. With all of that going on, I skipped out on running for another week until this past Sunday when I logged over 6 miles on the treadmill. I hit the gym Monday and Tuesday morning as well and logged some more miles. So far so good! I am hoping to get a lot more miles in as I plan to start an actual Boston Qualifying Marathon training plan the week of March 10! I wouldn't dare run on the streets around here. If you spend more than 5 minutes trying to figure out how people drive here you will want to shoot yourself. I barely trust drivers in the US and I'm not about to step on the road here. The sidewalks are too small and cramped with street vendors and people to use the them. Plus they are uneven and sometimes nonexistent. All of this is what really makes up the charm that is Bangkok, so I'm not trying to be negative. I have been on the look out for a race while in Bangkok. My options/chances are dwindling but the Thai associates are looking out for me. Pom has a runner friend who suggested a half-marathon/10k/5k this past weekend, which would have been the perfect opportunity but our plans (which didn't happen) kept me from pulling the trigger. My best opportunity may have been the first weekend for the big Bangkok Marathon. This typically happens in November but due to flooding it got delayed. So if I would have kept up my base for two months, I might have been able to participate. I don't know if it was sold out or not though. I'm trying to keep my eyes open for races but I'm having trouble finding a good database of races. The closer to the SkyTrain the better too! That is it for now. I really need to keep up the running, but that's mostly because this weekend we are headed to Hua-Hin beach! Woo hoo! My solution for the AC issue was to turn the AC low in the living room and turn the AC off in the bedroom (I have two AC units). I then leave my door open and it does a sufficient job keeping my bedroom cold and no air blowing over me at night. I will say that I rarely do sleep straight through the night; however, I realized today that I hardly sleep through the night at home too. I just never thought about it that much. One of the things I looked forward to the most on this trip is to learn more about the culture and history of Thailand. The last two weekends did not disappoint. We have visited many temples, both current and old. We were informed in advanced that during today's tours we should plan to wear pants and shoes that are easy to get on and off. Certain temples do not allow excessive skin showing as a sign of respect and wearing shoes is forbidden. Much of the custom in Thailand (and other Asian countries) is to take your shoes off before entering certain structures; however, we've only encountered the temples so far. The hotel staff will take their shoes off before entering my room. I wore my Merril shoes that do not have laces and blue jeans. It was going to be a hot day with the jeans, but worth it. This was the residence of the previous kings of Thailand since 1782; however, the current king does not live here but they still have official events at the balance. It is a very very large complex with massive buildings and temples. This is also home of the Emerald Buddha, which has been the reason for 3 wars since it's existence. The cost to enter the Grand Palace was 400 baht, or roughly $13. Throughout the Grand Palace there were very long murals that depicted scenes from Buddhist and Hindu mythology. These statures were actually used as ballast on ships trading with China. Seems kind of fancy ship materials! The Emerald Buddha. Photos are prohibited inside the temple, so this is from afar. The Buddha has different gowns placed on him based on the seasons. Scenes from the mural He is actually protecting the people. Not eating them. One of the Royal cars. One of the large structures within the Grand Palace. It's mostly in European style except for the roof, which is traditional Thai. The king will come out out the top floor to speak to the people. This is another Royal vehicles. You can tell because of the three Thai letters on the license plate (normally there are two). I snapped this as it drove by. I just thought it was kind of funny being a Chevrolet. A lot of pork, chicken, shrimp, and some pork-stuffed squid. Yes, I tried it. After lunch we hopped on a boat to cross the Chao Phraya River to visit Wat Rakung. It was a short stop but there were a lot of bells, as well as an image of a Buddha. Full disclosure: I might not have taken this photo at Wat Rakung. Wat Pho is the Temple of the Reclining Buddha. It is one temple that I know I've seen before in books when I was younger. I was pretty excited to see this one. This Buddha is absolutely massive. I would love to know how it was constructed and what kind of material. There are 108 bowls that people place coins into that is thought to bring good fortunate. It was really neat hearing people drop coins into these as it reverberated inside the large temple building. It was actually pretty soothing. This is the Temple of the Golden Buddha. We took a taxi from Wat Pho to Wat Traimit. This temple was one of the near temples but that's only because it was built about 60 years ago to replace an existing structure. Interestingly, this solid gold Buddha was covered in plaster within the last 250 years to keep it from being stolen and/or to protect it from the Burmese in 1760s. That had been forgotten until the new temple was constructed when it fell during installment in the new template. The plaster was cracked and the gold Buddha was discovered. Very neat! I really should have bought a wide angle lens before coming to Thailand. After the Golden Buddha, we decided it was time to head over to dinner by the Thewet pier stop on Chao Phraya river. It was north of the Wat Rakung that we had visited earlier. Transportation was a definite must and we had a hard time getting a taxi to take us (not sure why, close to shift change?) So thus started our first Thuk Thuk ride. 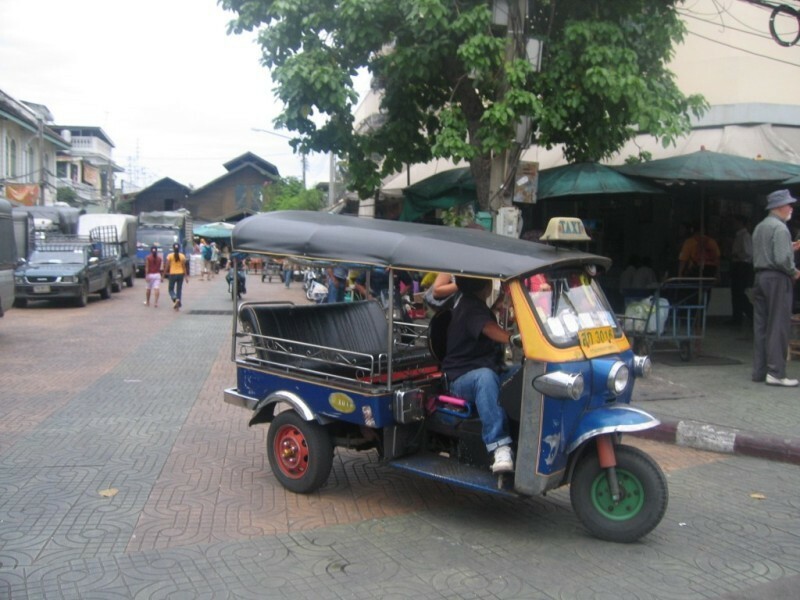 This is a three wheeled vehicle with a bench on the back to take passengers to their destination. From the middle of the bench. I felt safe with Peter and Toom on either side to keep me in. It really wasn't scary. Kind of fun! Picture of a thuk thuk. Stolen from http://schang43.xanga.com/699684219/the-land-of-thighs/. I'll replace it when I snag of photo of my own. There was a lot more food served. Once again, it was all delicious! We were waiting for the sunset but due to the clouds, it wasn't really cooperating! Still very pretty! It was a great day that started around 9am and ended close to 7pm. Thanks to our wonderful tour guides for taking care of us for the day! Por, Jingjo, Toom, and Pom! All of these associates work in the Development team with me. After our second week of work, we were treated to another fun day visiting temples with another department. This time we visited the "old city" of Ayutthaya, Thailand. Ayutthaya was basically the previous capitol of Thailand. During a war with Burma in 1765, Ayutthaya was seized and burned by the Burmese. Many of the art and history was destroyed during this time period, as well as buildings and temples. What we saw was basically ruined but many of the bricks and stones were actually transported to the new Grand Palace to help construct its buildings (according to Wikipedia). The day started fairly early at 8am by meeting our tour guides of more Thai associates in the office. They charted a van to take us the hour long ride to Ayutthaya. For those who followed the news in October 2011, you'll remember that Bangkok had horrible flooding and the dark part of this fence shows the flooding line. Yeah, it was pretty bad. Pretty much everything we saw today was under a couple feet of water at one point, if not more. A palace complex built in the 17th century that is occasionally used today by the king. It contains a many buildings used by the previous kings. Oh fun. Weep didn't really take to the "stylish" plaid. I think all tourist places need this type of transportation available. Think it would go well at Disney World? I believe Peter coined this as "Land Whale". Wonder if Brodie would like this as a fellow pet at home? Across the Chao Phraya River we visited some temples and buildings that were more in the European architecture. A Cannon Ball Tree blossom. Looks like it could eat you. Needed a wide angle lens. After the Palace, our friends took us to a riverside restaurant. With a full stomach, it was time to ride an elephant! We went to a place connected to the temple ruins where you could watch an elephant show, feed the elephants, and ride the elephants! This white elephant is apparently very rare. Immediately after this photo, the elephant mugged me for cash so I could get my camera back. Funny, elephant. Funny. Esteb decided that's about as high as necessary. Another temple area that had been destroyed but in this area there were some Buddha images that were still standing, even if it was just a partial statue. A famous image of Thailand. The head of a buddha image was placed in this location and tree roots have grown around it. Very neat. Some of the ruined with Buddha images. We had to drive a little bit to get to this temple ruins and it was very neat and one of the most impressive of the day. Due to the flooding we could not walk through and see the ruins up close, which was a shame. The main temple buildings was open so that you could actually go inside. The temple was right next to the river, so we sat near the shore for a while to relax before heading over to dinner. The temple before the war. Trying to be artistic. A bit dark. We made it back to Bangkok around 7:30pm or so. It was a long and wonderful day. Our tour guides were absolutely wonderful and patient with us (ok, maybe not Weep... he kept us on time!). There are probably 600 photos from everyone on Facebook but you can find all my photos from the day on my Flickr stream.